It pays to get ahead at Christmas. A bit of effort now – assuming you have the freezer space – and you’ll have something warm and comforting to come home to after Midnight Mass or to feed the assembled family when you’ve all tired of turkey. 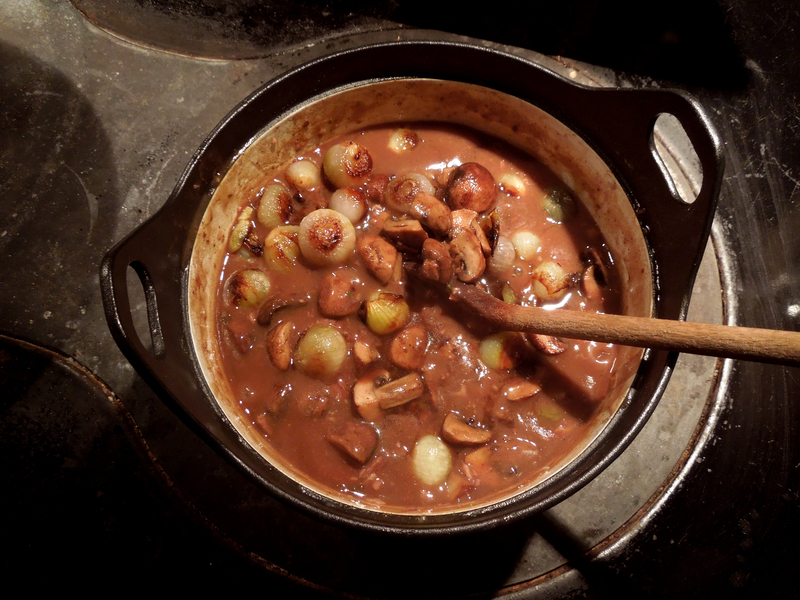 A personal favourite is the classic Boeuf Bourguignon, slow cooked in a good red wine and garnished with baby onions and mushrooms. Serve it with celeriac mash or just buttery mashed potato and some steamed broccoli or carrot batons and you will have peace and goodwill at the dining table. You can marinade the beef, if you like, in the red wine with the addition of two tablespoons of olive oil and a sliced onion. Leave it for four to six hours and keep the strained marinade to add later in the cooking. Or you can skip this step, as I did. I made twice the quantity below. If you’d like to do the same, just double up on all the ingredients. Trim the beef of any gristle and cut into large bite-sized chunks. 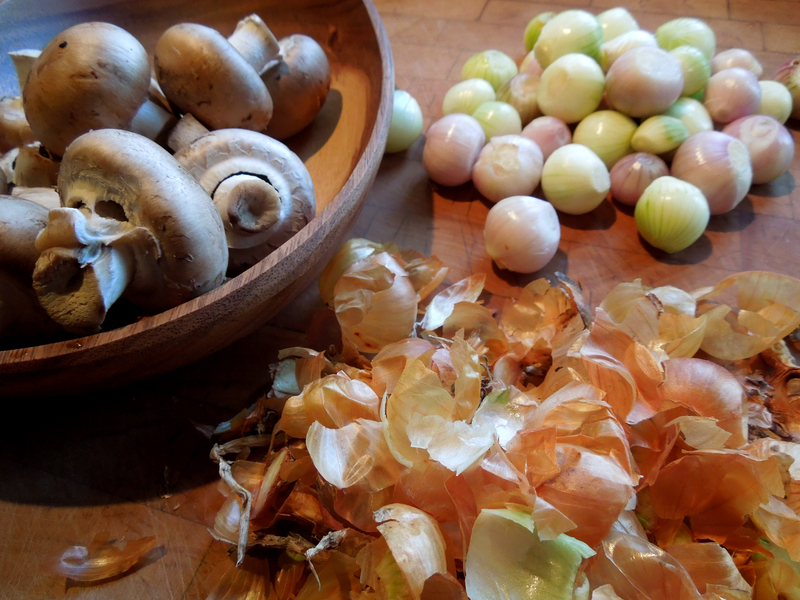 Peel the onions – a labour of love – and quarter the mushrooms if they’re too big. Heat a couple of tablespoons of olive oil in a large, heavy pan and quickly fry off the beef in batches until browned on all sides. Remove from the pan and set aside. Cut the bacon into lardons and melt them in the pan until they’re translucent but not browned. Remove and set aside with the beef. 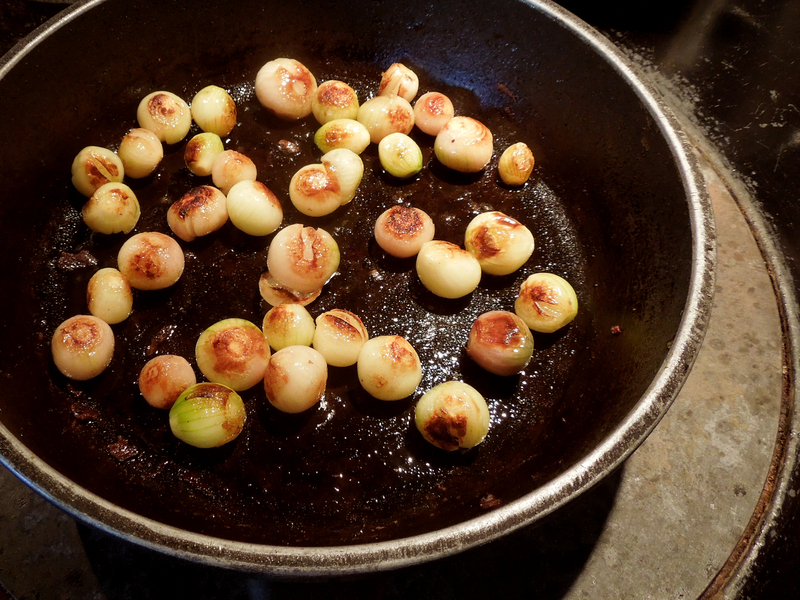 Add a little more oil to the pan and fry the baby onions until golden all over. Set aside until later. Now add the mushrooms (whole if possible, quartered if large) and fry for a couple of minutes to get rid of any excess moisture. Set aside with the onions. Let it bubble up for a minute or so and add the beef stock, garlic clove and bouquet garni. Season to taste with plenty of freshly ground black pepper but go easy on the salt because of the bacon. Cover and simmer gently on top of the stove for two hours. Then add the mushrooms and onions and cook for another half hour or until the meat is meltingly tender. 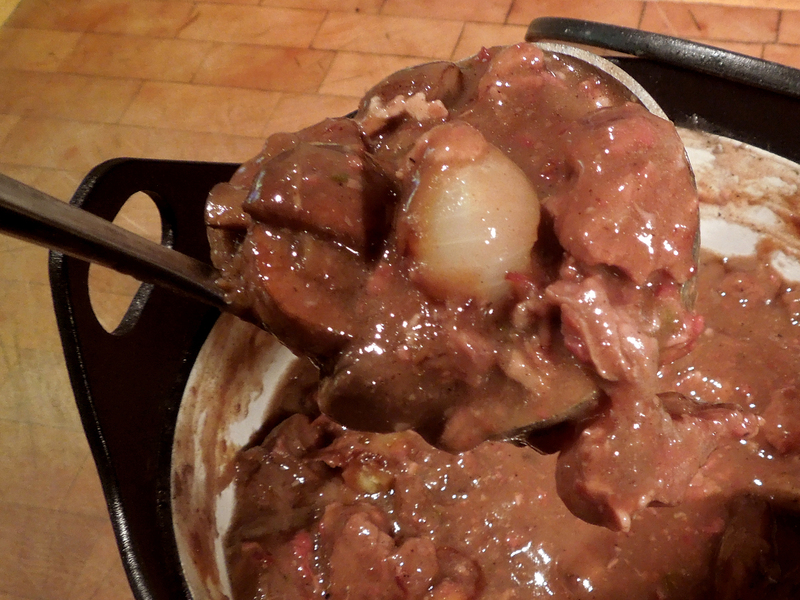 If you’re not eating the stew straight away, add the mushrooms and onions but finish the cooking on the day you want it. This freezes well and is all the better for being reheated at a later date. 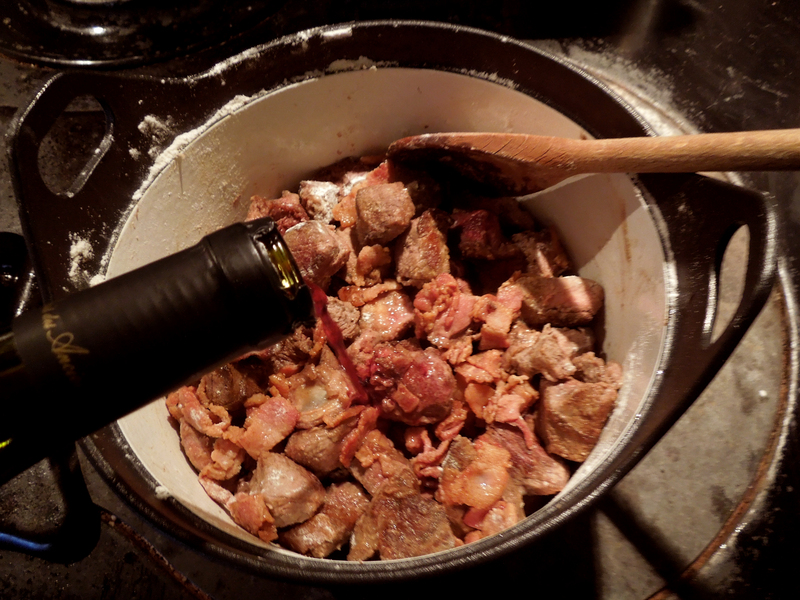 This entry was posted in Beef, Mains and tagged beef stew with red wine and mushrooms, Christmas recipes, classic boeuf bourguignan by Linda Duffin. Bookmark the permalink. As I have a quarter of a cow coming I will try this. You don’t do things by halves, do you?! Love the onions. Delicious Bourguignon. Thanks Conor. I love whole baby onions in a stew, gives you such a flavour pop. Such a great idea to do ahead, so as to be able to be less stressed during the holiday. 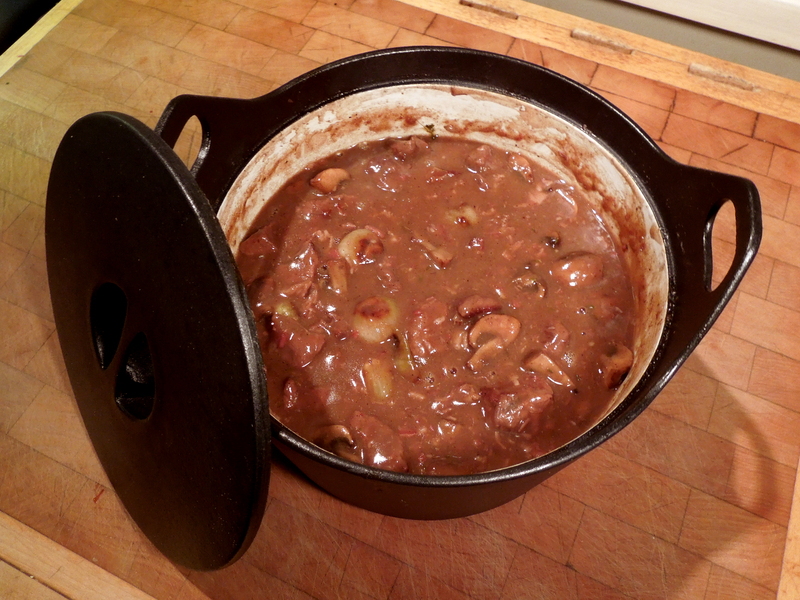 Looks like a perfect Bourguignon! Thanks Michelle. It’s certainly a handy thing to have a vat of in the freezer.